Author(s): Martin Boegemann, Department of Urology, Muenster University Medical Center, Albert-Schweitzer-Campus 1, GB A1, D-48149 Muenster, Germany. Andres-Jan Schrader, Laura-Maria Krabbe, Edwin Herrmann. Introduction: Recently, an increasing number of systemic therapies with life extending capacity have become available in metastatic castration resistant prostate cancer (mCRPC) i.e. Abiraterone acetate, Enzalutamide, Sipuleucel-T, Docetaxel, Cabazitaxel and Radium-223. More compounds are currently being evaluated in promising pivotal trials (e.g. Tasquinimod, ARN-509, ODM-201, and more). Limitations of the currently available biomarkers make treatment decisions challenging. Considering the ever increasing complexity of treatment algorithms in mCRPC the current demand of research is to find and characterize biomarkers with prognostic, predictive and surrogate quality, allowing for information on clinically meaningful outcomes and on which therapy to offer patients in different and complex scenarios. Methods: A comprehensive English-language literature review was performed through PubMed to identify articles and abstract presentations of the major conferences on cancer during December 2014. Results: In this review we address established biomarkers like prostate specific antigen, lactate dehydrogenase and alkaline phosphatase. 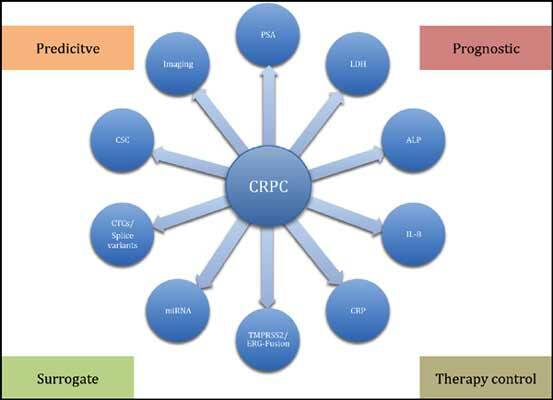 Emerging biomarkers like circulating tumor cells, androgen receptor splice variants, cancer stem cells and imaging biomarkers have also been reviewed and placed in the context of prognostic, predictive and surrogate implications in the current field of CRPC. We elaborate on the requirements of good biomarkers and discuss possible future developments of biomarkers in CRPC. Advances in knowledge of biomarkers in CRPC and thus biomarker driven therapy monitoring and up-front therapy decisions may help in the future to tailor treatment algorithms, give information on which therapy to offer and when to continue a given therapy in equivocal scenarios. This could maximize treatment benefit and minimize toxicity. Keywords: Biomarkers, castration resistant, mCRPC, novel therapeutics, predictive, prognostic, surrogate. Affiliation:Department of Urology, Muenster University Medical Center, Albert-Schweitzer-Campus 1, GB A1, D-48149 Muenster, Germany. Keywords:Biomarkers, castration resistant, mCRPC, novel therapeutics, predictive, prognostic, surrogate. Abstract:Introduction: Recently, an increasing number of systemic therapies with life extending capacity have become available in metastatic castration resistant prostate cancer (mCRPC) i.e. Abiraterone acetate, Enzalutamide, Sipuleucel-T, Docetaxel, Cabazitaxel and Radium-223. More compounds are currently being evaluated in promising pivotal trials (e.g. Tasquinimod, ARN-509, ODM-201, and more). Limitations of the currently available biomarkers make treatment decisions challenging. Considering the ever increasing complexity of treatment algorithms in mCRPC the current demand of research is to find and characterize biomarkers with prognostic, predictive and surrogate quality, allowing for information on clinically meaningful outcomes and on which therapy to offer patients in different and complex scenarios.